He’s lost weight, and is back doing the quadruple jumps that helped him win three world titles. But only a few weeks ago, there were days when Chan wondered if he’d made a massive mistake returning to competition. He wasn’t confident he still had what it takes. “There was a sense of worry, like ‘Oh my god, am I ever going to be able to do it again? Maybe I’m too old for this, or maybe my body can’t do it anymore, ’” Chan said. 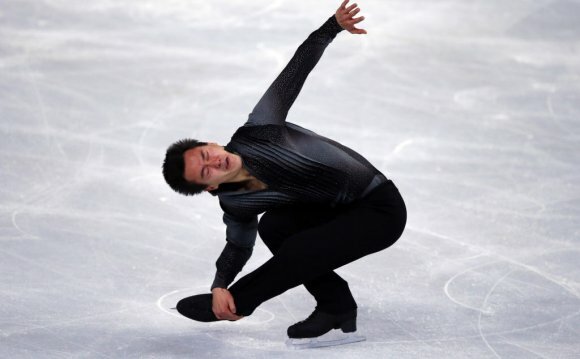 Chan stepped away from the competitive ice after his silver medal at the 2014 Sochi Olympics. He skated professionally, performing in more than 40 shows around the world last season. Then, feeling he had unfinished business, he resumed training in earnest in June for this coming competitive season. There were some rough days in the beginning. His coach Kathy Johnson took a few phone calls from Chan looking for reassurance. Skating his short program to Michael Buble’s version of the toe-tapping tune “Mack the Knife” on Wednesday, Chan looked like he was back at his competitive best. He’s lost about eight pounds, and is about three pounds lighter than what he weighed in Sochi. “I wanted to be 150, which was back to my weight in 2011, when I won my first world championships, ” Chan said. “I noticed that my quads and my jumps at that time were much lighter, and my margin for error, in my air position and stuff, was much larger. Chan faces Japan’s Yuzuru Hanyu — who defeated the Canadian for gold in Sochi — right off the bat, at Skate Canada International next month in Lethbridge, Alta. Nam Nguyen, the 17-year-old who won last season’s Canadian title in Chan’s absence, said he’s happy to have the veteran skater back. On the women’s side, two-time Canadian champion Kaetlyn Osmond is back after missing all of last season with a broken leg. The 19-year-old from Marystown, N.L., was practising last September when she swerved to avoid another skater. She caught an edge and fell, fracturing the fibula in her leg. “It’s probably the first time I’ve ever been injury-free in my life, so it feels absolutely fantastic, to be able to come back and not have any pressure put on me because of it, and it’s just a year where I can have fun with it, and just enjoy being back in competition, ” Osmond said. She had a rough comeback, at first refusing to practise when other skaters were on the ice, and then avoiding the portion of her program on which she fell. Where to Buy Figure Skates in Toronto?